If a bond with a face value of Rs1,000 is paying 8% interest and if the interest rates go up in the market then the price of the bond will come below Rs1,000. When we talk of bond yields, we are basically referring to yield to maturity (YTM). Remember, YTM is different from the interest rate on the bond, which remains static. If a bond with a face value of Rs1,000 is paying 8% interest and if the interest rates go up in the market then the price of the bond will come below Rs1,000. As a result, the YTM will become more than 8%. The bond price moves to adjust the YTM to the shifts in interest rates. Consider the following table for a bond maturing in 5 years. The above table clearly shows how the YTM is linked to the coupon rate of interest and the bond price. If the bond price is lower than the redemption price, then the YTM will be more than the coupon rate and vice versa. 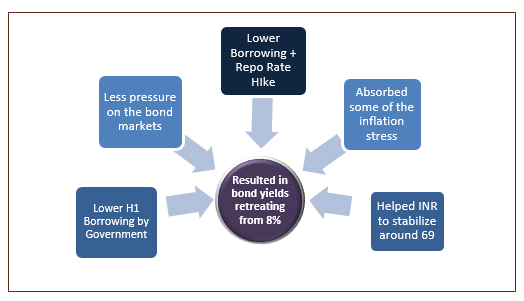 So what exactly impacts bond yields in India? How did the 10-year bond yields pan out in the last 1 month? The 10-year bond yield (government bond with maturity of 10 years is normally considered as the benchmark for bond yields. When you refer to benchmark bond yields in India, you are by default referring to the 10-year bond yields. Consider the 1-month chart below. After briefly crossing the psychological mark of 8% yields in the month of June, the yields have retreated now and are reflecting a more normalized scenario in the bond markets. While yields went up in June on the back of panic on the crude oil and the inflation front, the RBI June policy did help matters. By hiking the repo rates by 25bps in June policy, the RBI has given a hint of shift in its stance. The rate hike will absorb some of the pressure on the rupee and that has also helped to temper the bond yields. Between June and mid July 2018 there were key developments that led to the lower bond yields on the benchmark 10-year. Firstly, the H1 borrowings target which set lower at Rs2,88,000cr (23% lower) has been respected. Secondly, the June monetary policy has hiked rates by 25bps and absorbed some of the pain of higher crude prices and weaker rupee. Let us understand both these points inter-play. Every year, the Finance Ministry announces the borrowing targets for the first half of the fiscal year, which is normally linked to the level of fiscal deficit. For fiscal year 2018-19, the government announced H1 borrowing target of just Rs2,88,000cr. This was 22.6% lower than the government borrowings of Rs3,72,000cr in H1 2017-18. Also, the government will borrow just 48% of its full year target in the first half of 2018-19 as against the norm of 65% in previous years. Why did this lead to lower bond yields? Firstly, lower borrowing target means that the government demand will not crowd the bond markets. That increased demand for bonds and pulled down prices. Also the decision to phase the borrowing program between H1 and H2 equally will reduce the pressure in the first half. What is more important is that in the first 3 months of the fiscal, the government has respected the lower borrowing target. When the Monetary Policy Committee (MPC) announced its monetary policy in early June, it was clear that the rate hike was purely meant to absorb temporary macro pressures. It meant that the RBI did not see reasons to hike repo rates unless the data really warranted. That was seen as a positive signal as markets were wary that RBI could consider a series of rate hikes during the year. However, it now looks like the RBI may at best look at one more rate hike in this calendar year, which is something the markets can surely absorb. The final word on this subject may not have been said. The ultimate outcome of the entire bond yield debate will depend on the monsoons, Kharif output, and food inflation and of course, how the US Federal Reserve works out its rates trajectory. That is still awaited!